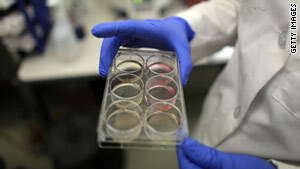 The stem cell litigation resulted from a lawsuit against the National Health Institutes. (CNN) -- An appeals court has permanently lifted an injunction imposed by a federal judge, thereby allowing federally funded embryonic stem-cell research to continue while the Obama administration appeals the judge's original ruling against use of public funds in such research. The U.S. Court of Appeals for the District of Columbia Circuit agreed Tuesday to permanently lift the injunction and allow the National Institutes of Health to continue research. The court had temporarily lifted that injunction September 9 pending further consideration. "President Obama made expansion of stem cell research and the pursuit of groundbreaking treatments and cures a top priority when he took office," White House spokesman Robert Gibbs said in a statement. "We're heartened that the court will allow NIH and their grantees to continue moving forward while the appeal is resolved." District Court Judge Royce Lamberth earlier this month said he would not agree to delay his injunction while the case was appealed. "Defendants [the government] are incorrect about much of their 'parade of horribles' that will supposedly result from this Court's preliminary injunction," Lamberth wrote in his court order in early September. The "horribles" he referred to are an extensive list of research projects outlined by the National Institutes of Health that would have to be shelved if a stay were not granted. "Congress has mandated that the public interest is served by preventing taxpayer funding of research that entails the destruction of human embryos," Lamberth said. "In this court's view a stay would flout the will of Congress as this court understands what Congress has enacted. ... Congress remains perfectly free to amend or revise the statute. This Court is not free to do so," Lamberth said. Lamberth's ruling, which stunned the administration, stopped any further medical research that involves the use of taxpayer dollars to fund projects requiring the destruction of embryos. The appeals court ruling Tuesday allows research to continue during the U.S. Justice Department appeal. The litigation resulted from a lawsuit against the National Health Institute filed by researchers opposed to use of embryonic stem cells, a group that seeks adoptive parents for human embryos created through in vitro fertilization, the nonprofit Christian Medical Association and others. When the injunction was first issued by Lamberth in August, Ron Stoddart, executive director of Nightlight Christian Adoptions -- one of the groups that filed the lawsuit -- said he supported adult stem-cell research that doesn't require destroying embryos. "Frequently people will say why are you opposed to stem-cell research and of course our answer is, 'We're not,' " Stoddart said. "We're opposed to the destruction of the embryos to get embryo stem cells." CNN's Bill Mears and Phil Gast contributed to this report.